I titled this Summer Evening because I can just see stepping out on the patio on a nice cool summer evening(somewhere other than Tx) after dinner for a little sit down. Doesn't that kitty look comfy? By the way, Welcome newest followers, will try to keep things interesting for you. Supplies: Ivory Card Blank 5 1/2" X 6" Hot Hues, Papers: Stampin Up-Very Vanilla, Elegant Eggplant, Soft Suede, Stamp: Stampin Up-Peace Within, Ink: Stampin Up-Soft Suede, Copic markers, Stampin Up-Sizzix Textured Impressions Square Lattice, Martha Stewart-Checker Board border punch, Score-Pal, ribbon-Offray, pop dots. This is a lovely card, and the image is just beautiful! Great image, and love your coloring. Thank you so much for entering this in our challenge at Digi Doodle Shop's Best. What a beautiful card. I love the background strip of paper you used - it adds such a great texture. Awesome job!! 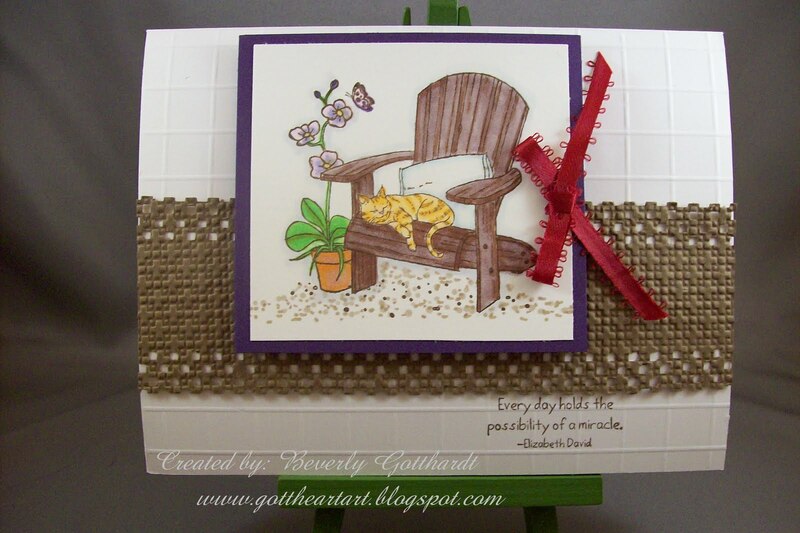 Thanks for joining us here at Digi Doodle with this adorable textured card. That cute little outdoor scene is just the ticket these days. Love it. I love this stamp!!! Gorgeous card! Thanks for playing along with us over at the Digi Doodle Shop's Best! Wow!!! The TEXTURE is splendid!!! Thanks for sharing with us this week at Digi Doodle Shop’s Best and Good Luck! So cute!! Thanks so much for playing along with our texture challenge this week at DDSB! Fabulous creation! Thanks so much for joining us this week at Digi Doodle Shop's Best! Lovely!! !Thanks for joining our challenge at Digi Doodle Shop's Best. Today we start the new challenge. Maybe you will join us again?